With the Summer fruit and vegetable supply in full swing and abundance, Mark Bittman’s 101 Simple Salads for the Season is perfect timing. 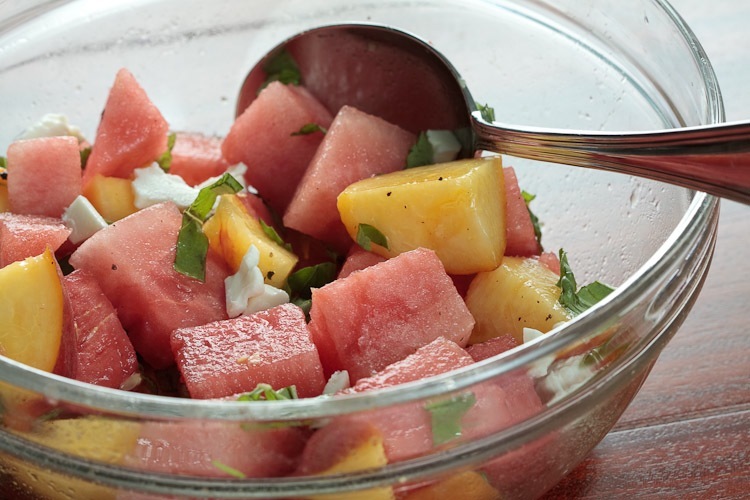 After getting a good haul of tomatoes, watermelon and peaches from the farmers’ market, we decided to start at the top of the list with two salad recipes that combine all of these. The first salad called for cubed watermelon and tomato chunks, but we substituted peach for the tomato. Add basil and dress with a basic vinaigrette of olive oil, vinegar (we used apple cider vinegar), salt and pepper. We added a little bit of feta, as well. The second salad called for tomato wedges and peaches, slivers of red onion, a few red-pepper flakes and cilantro. Dressing is olive oil and lemon or lime juice. Delicious and refreshing!! Yay Summer! !